The MPs highlight a warning from the Met Office that UK summer temperatures could regularly reach 38.5C by the 2040s. But, as we know, Harrabin is not an objective journalist. 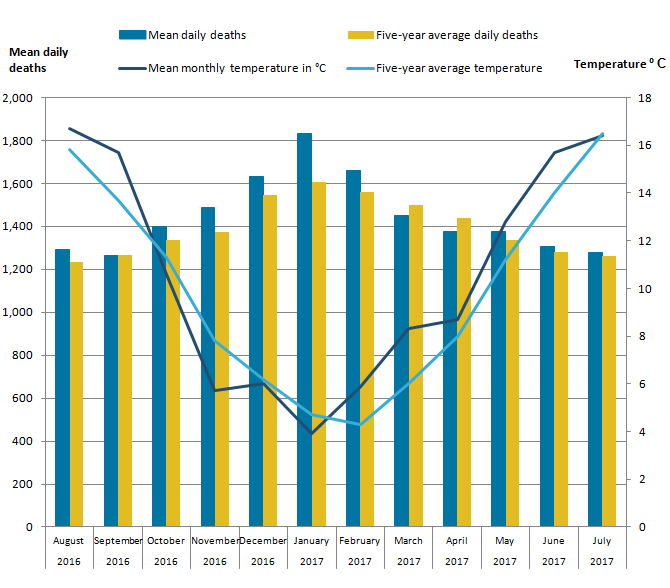 In the UK, many more preventable deaths happen because of cold weather than hot weather, but the government has failed to deliver its targets for insulating homes. He obviously has not realised that insulating houses will actually trap heat in all of those heatwaves to come! In fact, there is little correlation between winter deaths and temperatures. The causes of excess winter deaths are extremely complex, as the ONS attempt to explain. In my view, one important factor is the combination of cold and damp, which certainly has an impact on respiratory problems. The wet winters we regularly experience here may help to explain why countries with lower winter temperatures, such as in Scandinavia, tend to have lower winter death rates. To address problems of damp, homes need to be well heated and properly ventilated. Either way, it is therefore critical that elderly people can afford to heat their homes properly. But Harrabin would much rather increase energy prices, in order to subsidise the renewable sources he is so besotted with. No real news or information to correctly inform the public on MSM what do they actually get paid to do ? in station data what we find is that warming is mostly in the winter months and in rising nighttime daily lows and not in daytime daily highs. not sure how these relationships would mean that this process drives heat waves in summer? I thought those “regular” summer heatwaves were originally due by 2000. Now it’s pushed back to 2040. Interesting! Regular summer heatwaves have always been with us. It’s a normal part of summer. But you can’t push the climate change fraud by telling people the truth. Scientists differ on whether the current global rash of heatwaves is definitely caused by climate change. But all agree… blah blah. Who are these ‘all scientists’? This is nonsense. “Scientists” need only be two, and if they are both greenie fanatics like R.H., they are most likely post-modern. The last time Harrabin was in a science lab was to pick up a D in physics. I notice that no-one ever points out that with more reliable affordable electricity more people could afford to install and run air conditioning – a solution that other hot wealthy countries employ and as Paul points out heat and ventilate homes in winter. The solution always appears to be more regulation (build houses so less sunlight goes in!) and of course do without so we can change the weather! Agree Sheri. I was surprised that Paul made the mistake of implying insulation is a bad thing in the heat. We have 2 metal sheeted farm buildings – one with insulated walls and roof and one without. During this hot weather the insulated building was cooler inside than outside, and with fans running was ok to work in. The uninsulated building was over 10c hotter than outside and unbearable to work in. We opened all the doors on the uninsulated to get the cooler 30c air from outside in. We have rigoriously kept the doors closed on the insulated building to keep the 25c inside air from being heated by the 30c outside air. Insulation prevents heat energy from transferring. Thus it reduces the solar heat on surfaces penetrating. It also stops thermal heat inside exiting through surfaces. However, in summer the reduction in heat entering far outweighs the trapping of heat inside – there’s a solution for heat inside – open the windows if it gets hotter in than out. From what I have read of the Environmental Audit Committee’s report it is riddled with assumptions and then statistically manipulated? to reach worthless conclusions. Harrabin’s article is just another example of False News with an agenda. Speaking of statistics, cognog, I wonder if the Horrorbin consulted the month by month death statistics for several years including, say, 2003? He might have learned something. 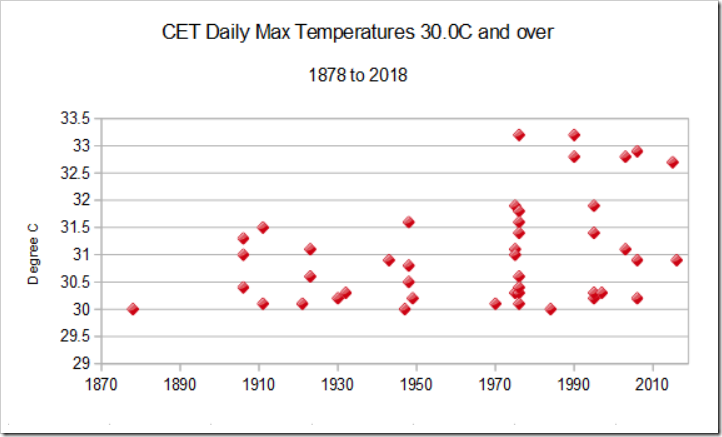 The CET Daily max temp chart from 1878 seems to show no max temps above 32° until the mid-1970s. Is that because of satellite coverage beginning in 1979? Some might use that to correlate those temps with rising CO2 since 1960? It’s interesting you use 1950. Originally, it was way back in the early 1900’s where CO2 creeped in as the boogeyman. Later, it moved all the way up to 1950. Now 1960? It looks like the data is being truncated to validate the theory. What I find interesting is that the year often varies, sometimes substantially. IIRC, this morning (31 July) it was 1901. Really? No record keeping at all by those science and engineering-mad early Victorians? How peculiar. Very strange. “7,000 heat related deaths each year if the government doesn’t act quickly” But he doesn’t say in which way the government should act!. The public’s tax err… license monies hard at work. There’s only one way to stop the drone of political bias and distortion – Stop paying for it. Act quickly how ? Build more windfarms I presume ? (delivering near zero power but making electricity less affordable so fewer vulnerable people can install the life saver – air con). As a friend that we visited in Dallas last Sept , when the temperature was about 35C, said : “without air conditioning it would be impossible to live here”. If you read the paper via the link provided it is actually a very good article and quite honest in that the risks of heat exposure have to be considered against the far greater risks in the UK from cold exposure . The latter , at present is running at about 42000 pa compared to about 3000 for heat related deaths (their Fig 3). Even by 2080 heat related deaths , by their climate extrapolation are only 1/3 of cold related deaths . We have been here before , and last year people posted the Lancet paper that showed that globally the increase in heat mortality does not offset the reduction in cold mortality in any scenario except the increasingly implausible RCP8.5 (and that only in a few tropical areas). It is so exasperating that people with the public relations power of Harrabin and his tribe at the BBC seem to take no notice of the readily available science unless it suits their own agenda. Guardian headline from 2012…WET & COLD: THE SHAPE OF BRITISH SUMMERS TO COME? Why do they bother? Just admit total cluelessness. 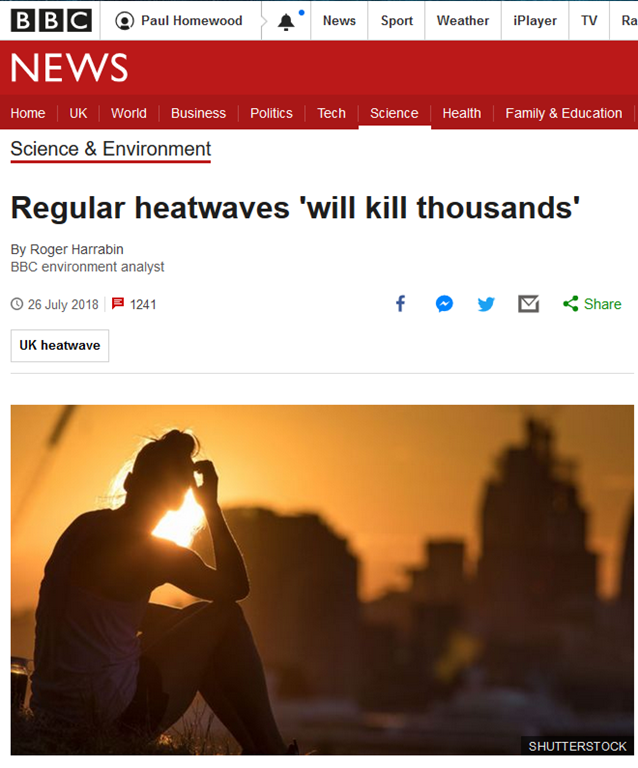 The link for 7,000 deaths does not point to an Environmental Audit Committee Report (which they launched at the day forecast to have record temperatures) but to a paper mentioned once in that report – Hajat S, et al. J Epidemiol Community Health DOI: 10.1136/jech-2013-202449. It was written with policy in mind. The ride of 257% (to >7,000) was from a base period of 1993 to 2006, with the 2003 record heatwave and the warm dry summer of 2006 at the end of the period. The paper was submitted in 2013, so up to six years of temperature data was available. 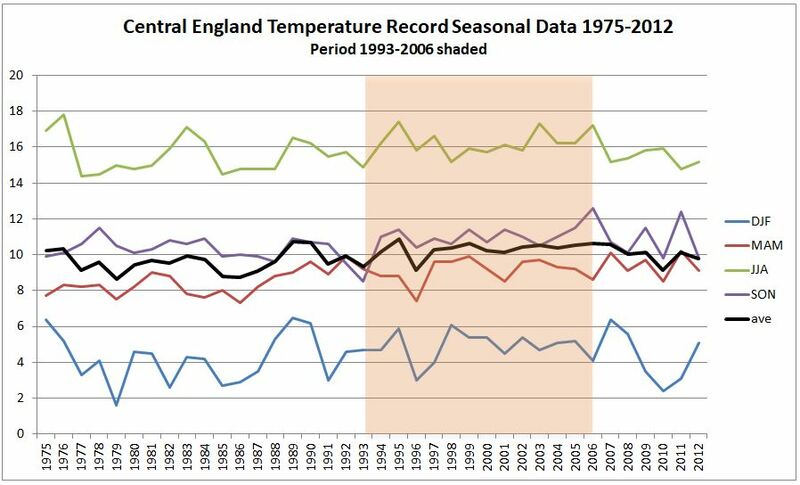 Check the Central England temperature record by seasonal data for a possible explanation. Another point is that although deaths from heat are projected to rise by 257%, they will still be less than a fifth of those from cold. The vast majority of both hot and cold deaths now are the elderly. The report says that deaths will increase because there will be more people and they will be older! Related to most of the deaths coming from the elderly, Figure 4 of Hajat et al 2014 illustrates the point. mean temperature 93rd centiles: North East (16.6°C), North West (17.3°C), Yorks & Hum (17.5°C), East Midlands (17.8°C), West Midlands (17.7°C), East England (18.5°C), London (19.6°C), South East (18.3°C), South West (17.6°C), Wales (17.2°C). Even with high sensitivities, the coldest region (North East) is unlikely to see temperature rises of 3°C in 50 years to make it as hot as London. Similarly, London will not be as hot as the South of France. The assumption of lack of adaptation literally means that people will not adjust to heatwaves at all. They will not drink more, keep in the shade, or get air conditioning. Families, friends, care homes and social services will be oblivious to the increasing plight of the most vulnerable in society, let them die in increasing numbers. Agree. All these ‘reports’ are rubbish as they use biased and naive assumptions plugged into statistical extrapolations. Thats not science. As you rightly point out there is no accounting for behaviour – gets hotter – take off layers of clothes and turn fan on = no mortality. Gets colder – put on clothes turn heater on = no mortality. the £millions wasted on garbage reports and parliamentary fake science committees is the travesty. Your Mr. H. isn’t clear what the government should do – maybe jump up and down, scream and shout. That would be an ‘in situ panic’. This makes me think of phrases an American writer named Pat McManus used in his funny stories of growing up in a rural area and being poor. Maybe you can find his “A Fine and Pleasant Misery” and then adapt his methods for your government. It really doesn’t seem like they intend to do anything useful. The prophesy of deaths relates to the 2050s. By government standards that is quickly. 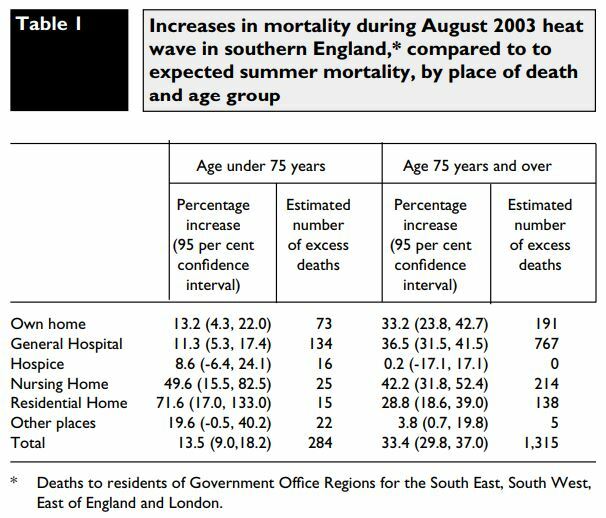 This tells us that more than half the excess deaths in that heatwave were in General Hospitals. It was on the basis of such statistics, coupled with overly sensitive climate models and an assumption of zero adaptation that the prophesy of 7000+ excess deaths relates to. The committee should have exposed this scandal of another example of excess deaths in NHS hospitals and made recommendations to reduce the impact. 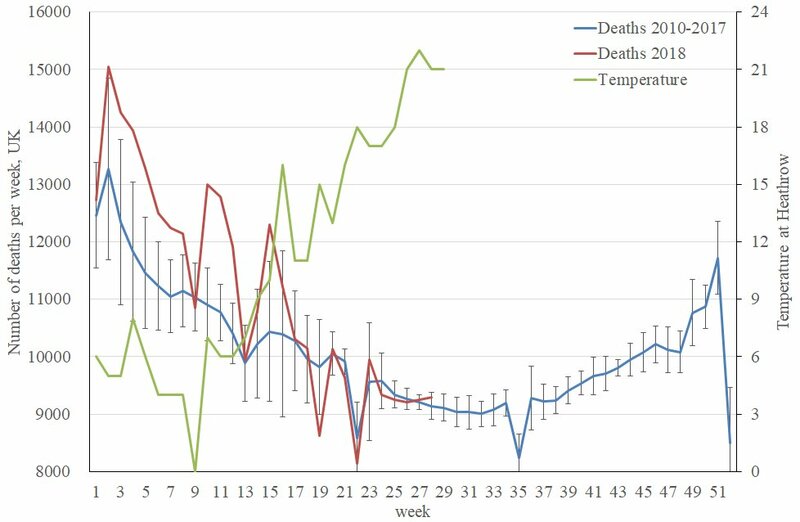 The experience of other countries tells us (a) air conditioning (b) highly focused heatwave campaigns, (e.g.making sure that people drink enough water) are the two primary ways of heat deaths have been reduced. Making electricity more expensive and banning plastic bottles are policies that are coming into play that will make the problem worse. Even those figures look very dodgy. A 72% increase in deaths under 75 in Residential homes produces just 15 excess deaths? That’s just smalll numbers fluctuating naturally. And many of these deaths are basically one ir two weeks “early”, not wholly preventable. Bumps in deaths during heatwaves are always followed by drops in expected rates. Oh, is that the Met Office who can’t forecast within 3.0 deg C, one day ahead. And they can forecast 38.5 Deg C, 22 years in advance, what utter bo££ocks. I understand dear old Roger has been offered a new role selling used cars – the MET office are diversifying and need to hit the ground running. The most peculiar thing about these supposed heat related deaths is that of the ones mentioned on 25, 26 & 7th July on BBC Radio 4, all seemed to be sadly of YOUNG people doing something risky in relation to water. Sometimes – not necessarily this month – alcohol consumption is also involved. How does Roger Harrabin account for those? I have identified six major assumptions. Assumption (6) implies that the Paris Climate Agreement will be a complete failure, and the expensive UK climate policies will be useless. These assumptions are realistic, but should be stated.